Though I live in Miami now, I grew up in Minnesota and I, being a plant lover, surrounded myself with tropicals to keep my thumb green and stave off cabin fever during those cold, dark months. I’ve always thought that winter is the best time to have houseplants, but unfortunately, it can be the hardest time to try to grow them. Make it a cinch with these easy tips! Most tropicals don’t need special temperatures and are typically just fine with the same kind of temperature range you keep at your home. One thing to watch for, however, is drafts. Big blasts of hot or cold air can take their toll on your leafy friends. In the North, cold drafts are pretty obvious; they force their way in through doors and windows. If you have an older house, you might also watch some of the more subtle ways drafts sneak their way in. For example, in one of the houses I used to live in, frigid air could come pouring out of electrical outlets. If you place tall pots in front of outlets to hide them (as I used to do), the stream of cold air to the roots can seriously impact a plant’s health. It’s not just cold air that affects plants. Watch that gloriously warm air coming from heating vents; it dries leaves out lickity-split! Another thing to watch for is humidity. Homes heated with forced air can actually have desert-dry humidity levels; a far cry from the tropical rainforests many houseplants hail from. Boost humidity levels to keep leaves lush and healthy. When there’s not enough moisture in the air, many houseplants suffer from dry, brown leaf edges or tips. 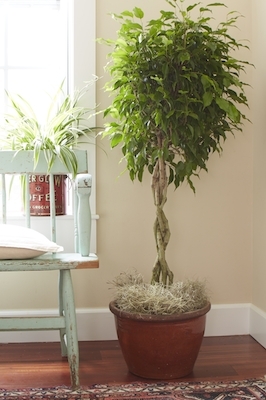 Your houseplants need water all year long – even when you’re busy with the holidays. The good news is that most plants need less water in winter, so take care not to drown them with too much love. As a general rule, cooler temperatures and less light mean plants drink less. Are you not sure when to water? The best way to gauge is to feel the soil with your finger. If you detect moisture, you probably don’t need to water. Winter brings light of lower intensity to most homes, and that can cause some high-light plants to struggle. If the plants start to get leggy, don’t be afraid to pinch them back to keep them bushy. If you notice your plants starting to develop yellow leaves, brown edges, or other symptoms, pay attention to the surroundings and see if you can figure out why before you try moving the plant. Bringing a plant from one growing environment to another can be stressful (remember, plants don’t get the opportunity to move around in nature). Don’t move plants around unless you really need to.